Perhaps stories about bedding in France is too much about nothing. I wish it could be over and done with myself. It just goes on… and on. In the afternoon, Geoffrey called for his daily update on my whereabouts. He wanted to lead me, in his borrowed van, to visit his friend who was going to check out Sally’s latest malady — a skipping engine. 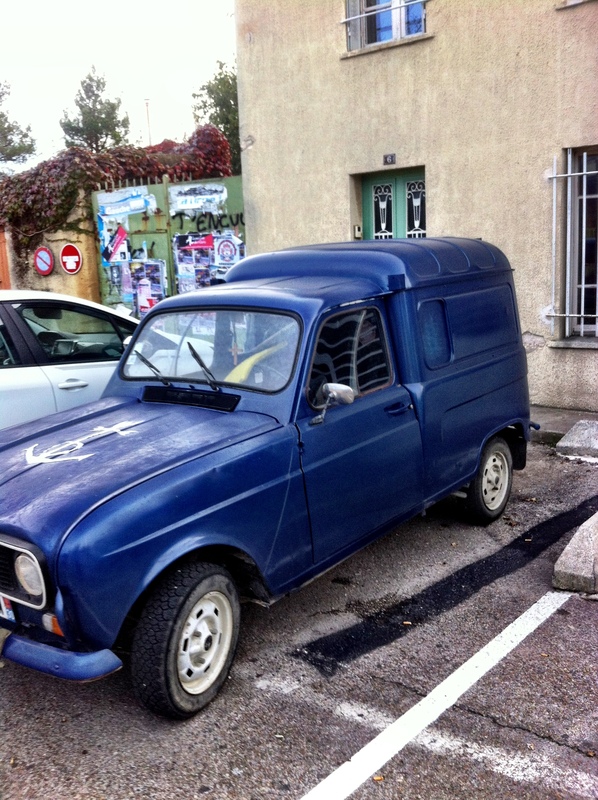 I had discovered there might be a problem with Sally’s transmission during my ride back from Nimes on Thursday. With a trip planned to the train station this week to pick up my house guest, I didn’t want to take any chances with Sally breaking down. Geoffrey and I met at his favorite cafe/bar, then took off for a “quick” stop at the nearby Monoprix store for … more sheets. I still needed bottom sheets for the guest room. Finding there was only one choice for bottom sheets for the odd-sized beds — i.e. top sheets to tuck in to fit — I resigned myself to paying 59 euros for the pair (approximately $80). Eyeing the purchase price with total amazement (as only a man can do! ), Geoffrey led be back up the main street of town to pick up a gas can at his house. For gas for the borrowed van he was driving, of course. Gas can in hand, we picked up Sally in her underground parking space and drove to the gas station for petrol. Then to the free parking lot behind the high school to find the borrowed van. You want me to drive this? Really! Geoffrey wasn’t falling for any of my new claims and insisted we continue with the plan to visit his friend for Sally’s checkup. It wasn’t until he started filling the gas tank that I saw the humor in it all. Did I mention his wardrobe choice for the day? AKA “disguise”? Promise, I don’t make this stuff up. It just happens. That’s why Geoffrey was put into my life here in France. He’s a book! Without going into too much detail, Geoffrey explained the Saturday ritual for many people living in this part of France. They awaken early to go to the Saturday market, they shop, they drink, they eat a leisurely lunch. Then they go home to bed. 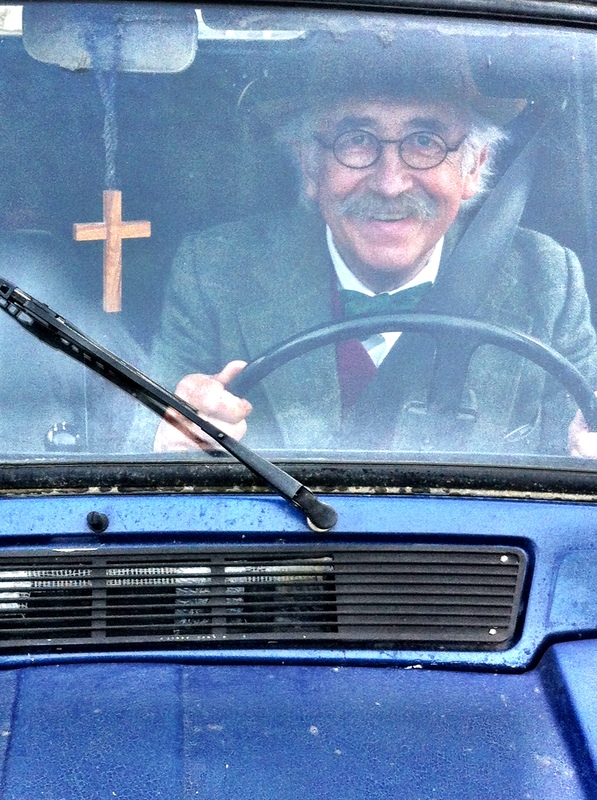 Paschal not only relieved my concern about Sally’s transmission, he fixed the window on the driver’s side of the car. It would go up and down. Or maybe it always worked? Can you believe I never tried to put the window down myself? I took Geoffrey’s word that it was broken. What was I thinking? All those times I wrenched my back opening the car door to pick up a ticket at the car park, I could have opened the window? Best of all, Geoffrey and I had finished our mission with enough time for him to lead me to the warehouse store we’d visited. For sheets. Surely I could find flat sheets for less than $80! Always happy to oblige me, Geoffrey scooted off in the blue van and I took off in Sally, heading for the discount store. I had totally forgotten how to find it again. In the sheet section of the store, Geoffrey witnessed for himself my confusion with bedding and sheets. He joined in on my search for top sheets to fit the 80×200 cm beds. The best we came up with was a pair of red sheets, sized 180×290 cm — obviously too big, but the smallest size available. Then we looked for pillowcases to match. “Why do you need pillowcases to match?” Geoffrey queried, proudly handing me packages with grey pillowcases. With that, I swear to you, I heard Geoffrey’s heels click as he turned around and headed for the front of the store. This, my friends, is the closest I’ve come to losing my composure in public in France. I continued chuckling all the way to the checkout counter to pay 30 euros ($40) for the pair of grey sheets. Not a bad day afterall. A savings on sheets and a great story to boot. Speaking of washing sheets….do you have washer& dryer, or do you have to go to a laundromat? And do they even have laundromats in France? Yes, I have a washer/dryer combo but could have separates too. Yes., they have one laundromat I’ve seen in town. Dry cleaning is very expensive. Debby, I look forward to each new post on your blog! Thanks for sharing your escapades – oops -adventures with your friends. Try as I might, Edie, I can’t find a bottom sheet to fit the 80×200 cm beds. I did find a mattress protector that’s like a fitted sheet, but I had to cut it in two to make it fit. I figured a flat sheet tucked under is a better solution than a fitted sheet that doesn’t really fit. So it’s really being used as a bottom sheet. About using the duvet… do you wash it after every guest’s visit like you would sheets? It’s still a puzzlement to me but I like the idea.